This Spaceteam review was made after playing the game eight times. 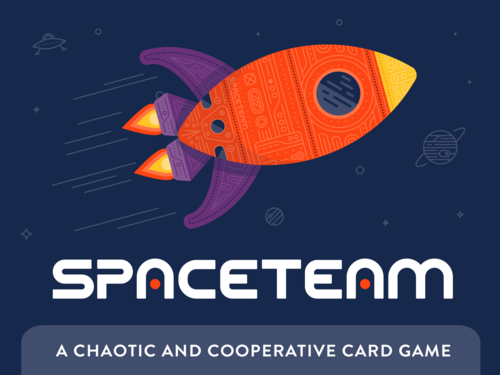 Spaceteam is a real-time cooperative card game in which you and your teammates must work together to fix your spaceship. The game was designed by Tim Hutchings, Mathew Sisson and it’s published by Timber & Bolt. Spaceteam is all about matching icons, images, and names while also listening for instructions from your teammates. If you know that about the game, you can be up and running in a few minutes. There are two decks of cards in this game: the Tool deck and the Malfunction deck. The Tool deck has 24 cards that players will be using to resolve the malfunctions and anomalies found in the Malfunction deck. 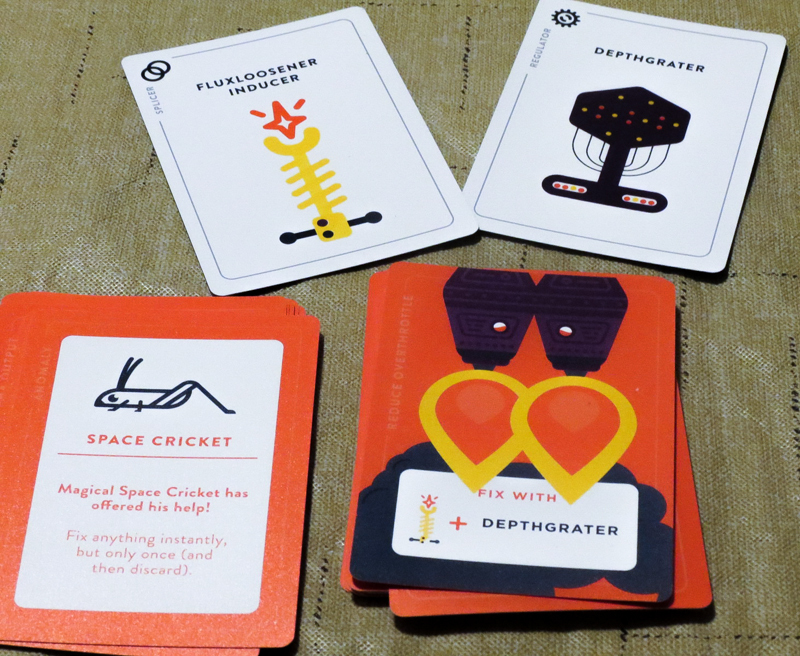 The Malfunction deck includes cards that show you what needs to be repaired, anomalies that need to be resolved, and six Systems Go cards that let you know how close you are to winning. To set up the game, the Tool cards will be evenly dealt out to all players. You’ll make the Malfunction deck based on the number of players and the difficulty level you want to play, mixing in a certain amount of Malfunction cards and Anomaly cards and then shuffling in the Systems Go cards. You’ll then deal out an equal amount of Malfunction cards to each player. Once you’re ready to play, the timer starts, then everyone flips their Malfunction decks and starts to resolve their cards one at a time. Each Malfunction card will tell you what you will need to fix it. You’ll need those Tool cards, but you might not have them in your hand. You’ll need to scream out to your teammates the names of the cards you need to completely fix those malfunctions. If you do need someone else’s tool, it will need to be passed around the table until someone sitting next to you can give it to you (no passing across the table!). Once you resolve a malfunction, you’ll pick up the tools that were used and move on to the next card. Anomaly cards will have you or your group perform an action. These actions include switching seats, switching hands, and moving cards from one deck to another, among other things. Once you do what your Anomaly card says, you move on to the next card in the deck. When you come upon a Systems Go in your deck, you place it in the middle of the table and read aloud the caption on the card. The six Systems Go cards each show you a part of the ship that has been fixed, so when you get all six down onto the table, you win! 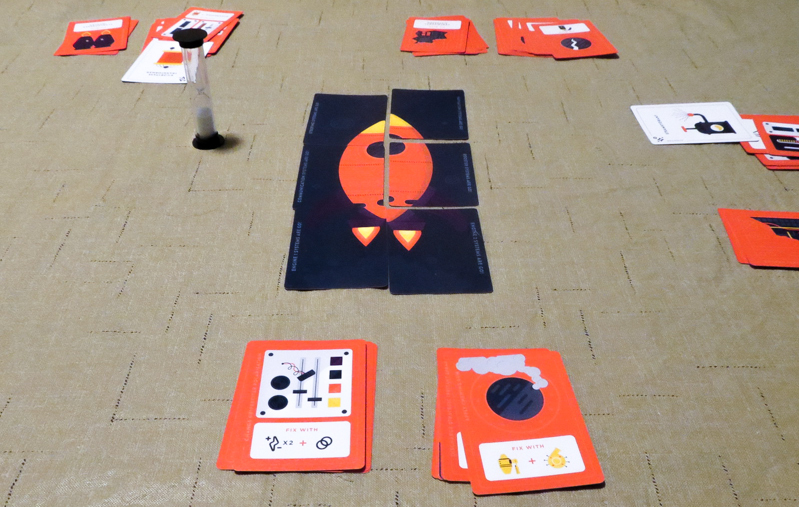 One thing that makes Spaceteam a bit different than other match-the-icon type games is that you reuse your cards. This is actually really cool because you have to listen to your teammates so you can quickly pass the tools you used to resolve a malfunction so they can resolve theirs. Many groups will love the Anomaly cards since they add a bit more chaos and hilarity to the game. This was also a creative way to make the game more challenging. The plastic cards, though a bit slippery, are nice. The artwork looks great on them and they’re extremely easy to shuffle. You’re not going to find too many other games that are this easy to learn and teach. Spaceteam isn’t too tough to beat at any difficulty level; well, it hasn’t been for my groups. Once you get used to the cards, you can clear out those malfunctions pretty quickly. We even had one game at the highest difficulty level where three of the Systems Go cards were at the bottom of the decks and we still won. It’s especially easy at lower player counts since you won’t have to pass your cards too far. There isn’t a ton of replay value here. I see this as a card game a lot of people will play five or six times and then put it on the shelf for a while. I’m not a fan of sand timers in games like this. Unless someone is watching the timer, it’s easy to miss when time’s up. You’ll definitely want to use a timer on your phone or one of the official timers from the publisher. I wouldn’t play Spaceteam over other small real-time cooperative games like 5-Minute Dungeon and FUSE, but some people I’ve played it with have absolutely loved it. They’ve liked that it’s quick, silly, and requires a lot of communication to beat. I’ve enjoyed those things about it, too, but it just seemed to be a bit too easy after a couple of games. Even though I’m not a huge fan of it, I think Spaceteam would be great for some groups. It could work very well as a game for older kids or for families, or even as a team building exercise for businesses. Plus, some gaming groups, especially those with five or six players, might find it to be a solid five-minute filler that they can pull out from time to time. I recommend checking out the free app (links below) to see if it’s a game for your group before you buy the physical copy. 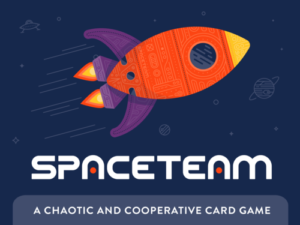 Thanks for taking the time to read our Spaceteam review! To stay updated on all things cooperative board games, follow us on Twitter, Facebook, or via RSS.